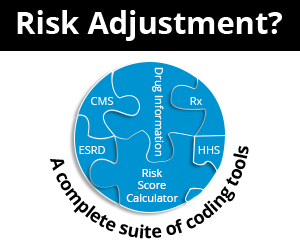 Risk Adjustment (RA) and Hierarchical Condition Category (HCC) coding is a payment model mandated by CMS in 1997, which was implemented in 2003. This model identifies individuals with serious or chronic illness and assigns a risk factor score to the person based upon a combination of the individual's health conditions and demographic details (called the Risk Adjustment Factor or RAF). The individual's health conditions are identified by the International Classification of Diseases - 10 (ICD -10) diagnoses that are submitted by providers on incoming claims. There over 9000 ICD-10 codes that map to 79 HCC codes in the RA model. As outlined in the Medicare Managed Care Manual, "CMS administers risk adjusted payments to Medicare Advantage (MA) organizations..."
CMS requires documentation in the patient's medical record by a qualified health care provider to support the submitted diagnosis(es). Documentation must support the presence of the condition and clearly support the provider's assessment and plan for management of the condition. The chronic conditions that are current and managed must be reported (and supported by the documentation for that date of service) at least once each calendar year for CMS to continue to "count" that condition towards the patient's overall risk level. The Official ICD-10 coding guidelines state that a condition must exist at the time of the encounter and affect the patient's care, or be actively managed AND be documented through the History of Present Illness (HPI), the Physical Exam, and the medical decision making. Each reported diagnosis should be documented in an assessment and a plan of care. According to CMS a simple list of "assessed" conditions alone would not support the diagnosis(es) reported without showing that the condition is current (active) at the time and/or evaluation and treatment for each condition. Code to the highest level of specificity. This can affect support for the risk factor if unspecified or generic codes are used. Coding of "history" as current: anything that is not supported as active at the time of the face-to-face encounter, such as "resolved" or "history of" conditions, should not be reported. Conditions and manifestations need to be clearly linked with such terms as "due to" "because of" etc. According to ICD-10, some conditions have a presumed cause and effect relationship such as hypertension and CKD (ICD-10 Section 1; 9. A.2.). Always code to the highest level of documented specificity. Chronic Conditions: don't overlook documented and supported chronic conditions that affect the patient's care and management. Be on the lookout for more information and services from NAMAS regarding coding and auditing for Risk Adjustment HCCs!